American pop star, Chris Brown and Nigeria’s Wizkid are billed to perform in Mombasa, Kenya in a few hours. 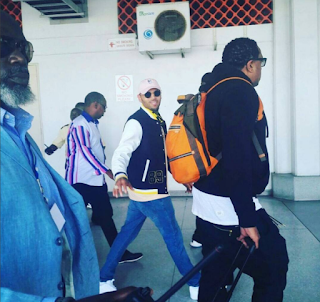 But Chris Brown’s arrival in Kenya has been met with controversy. Kenyans on social media are alleging that Chris Brown smashed a fan’s phone at the Moi International Airport (MIA) when he arrived this morning simply because the fan asked for a selfie. As a result the hashtag #DeportChrisBrown is now trending in Kenya. However, there’s a video that proofs his innocence. In the clip below, the female fan is seen requesting for a selfie but Chris simply walked past her without touching her phone.